KGNU's Indra Raj chats with Bill Frisell following the release of his album 'Music IS' in 2018. Indra Raj: It's really exciting to have you here because you grew up in Colorado, is that right? Bill Frisell: Yeah, I grew up in Denver. I haven't lived here for a long time. Pretty much after high school, I stuck around for a couple years. I went to Greeley for college and I was around a little bit, but pretty much I've been gone since the mid-seventies. I've been away, so it's always a special thing for me to come back. Every time I come back, it's like just the air… it blows my mind how when I get off the plane and the smell of the mountains - it's awesome. IIndra: Seeing how you did grow up here, I'm sure it brings back a lot of musical memories. Did you start playing guitar when you lived in Colorado? Bill: Yeah, everything happened here with so many teachers. I wouldn't even know where to begin. Well, you know, I started in the school music program at Teller Elementary School, and then Gold Junior High School, then East High School. And then later in high school I met my guitar teacher Dale Bruning, who's still here playing great and still teaching. So much happened here, and I heard so much music - really this was where all the seeds were, more than just seeds, stuff was really growing here, you know? Indra: I read that your first instrument was actually the clarinet. Bill: Yeah, I'm so thankful for it now. Looking back, what I took for granted or we all took for granted back then in the public schools, I remember they came around when I was like nine or ten years old and they asked everyone if they would like to play an instrument and that was just normal then to have that kind of music program in the schools. Denver still seems like it's hanging on, but I look around and it seems like it's sad how that seems to be the first thing to go when they're deciding what to cut down on. I still believe that music is a good thing. Of course, it's for fun, but it's important, too. Indra: Yeah, so many parts of the brain that are activated when you play instruments and sing so I agree wholeheartedly. So, you just released an album this year: "Music IS". Bill: Yeah, that just came out a couple months ago actually. Indra: And the title is "Music IS" and IS is all capitalized. So, I was wondering if you could tell us a little bit about what inspired the title for the album. Bill: Actually, what we were talking about before, talking about music in schools and another thing I say often is just the simple statement that "music is good." And I was thinking about calling the album that, and then I just ended up cutting it down to leave it more open. I hope somebody doesn't fill in the blank with "music is bad." Music is all kinds of stuff. It sort of came from that. I really have a hard time with titles. When I write a piece of music and then usually what I'm going to call it is the very last thing that happens. I try to come up with something that doesn't lock it in. I like for the listener to be able to make up their own story and maybe the title can kind of set you off in a direction or something, but not dictate what it really means. Indra: Speaking of albums, you released your first album "In Line" in 1983. Do you know how many albums you've released since then? Bill: Oh man, I don’t know. I've been so lucky, too. I can't even believe it. Thinking about growing up here and starting to play, and back then I never dreamt that I'd ever play on a record or get to tour around and do all the things that I'm doing now. I guess I would dream about it, but I never really thought [it would happen]. I knew that’s what I wanted to do, but I've just been so lucky to be able to record as much as I have. It's just crazy. IIndra: I think I was trying to count and I actually couldn't even count there was so many. I think it was easily over 30 albums, or maybe close to that. Bill: Yeah, it's pretty much once a year or sometimes even more, and thinking about all the other albums that I've gotten to play on with other people - then it gets into some crazy numbers. Indra: Given that you have been doing this for so many years and so many albums, is there something specific or a few things that drive you to keep making and releasing music so many years later? Bill: Well that's just the music itself. It's always been that - just from those first moments that I tried to pick up an instrument. It's like, you find something and it's just the ultimate seduction or addiction, I guess. You're looking for something and you find something that's almost what you were looking for, but it will show you something else, and you just keep following this thing. It keeps drawing you further and further along, and that just never stops. Early on, I guess I mistakenly thought there was a point where you would get it all together and you just have it all figured out. But luckily I figured out that's not true, and the realization that it isn't true didn't beat me down or discourage me too much. It's like the idea that you could never get it quite right and you can never finish it, so you just have to be comfortable. I don’t know if “comfortable” is the right word, but just love being in that place where you’re trying to figure it out. If you could get to the end of it, then there wouldn't be any reason to do it anymore. Indra: Sounds like that might play into all the different styles and genres that you've explored throughout the years, from jazz to folk and other kinds of Americana, weaving through all those things. With the latest album, do you find that you drew influences from some genres more than others, or how did it come out? Bill: That's the thing, for quite a while, I haven't been really thinking about the genre or what it's called. It's just all music. Thinking back early on when I first started to hear music, I mean, I loved music my whole life and when you're first hearing things, you're not thinking about what it's called or whether it's jazz or rock or Americana. You're seduced by the sound, and I fell in love with that. There's just no reason why what we call these different things - that always comes after the fact. The music happens and then someone tries to figure out how we can describe it or something. But, when you're in the midst of the music, you're not thinking about what it's called, so there's no reason why these things can't coexist with each other. Whatever I'm doing now is just a big conglomeration of whatever I've heard or liked or tried to figure out throughout my life. IIndra: Given that you've released music almost every year, do you have any thoughts for the project for next year or for the next couple years, or have you not really thoug about that yet? Bill: It's a little bit crazy, because I'm pretty much traveling pretty much straight through from now until August, and then when I come back, I'm going to record with Hank Roberts, a cello player that I've known for many years, and Petra Hayden, a singer. She's the daughter of Charlie Hayden. Then, Luke Birdman that plays bass, guitar and sings and I'm going to record with those guys. We've done a few gigs with that group and the first gig- well, Petra sings and then I had sort of an afterthought of "wait a minute Luke and Hank, they're both great singers, I'm the only one who's keeping my mouth shut...” But,they all started singing and it was like a whole different thing going on here, so there will be some singing on that one. 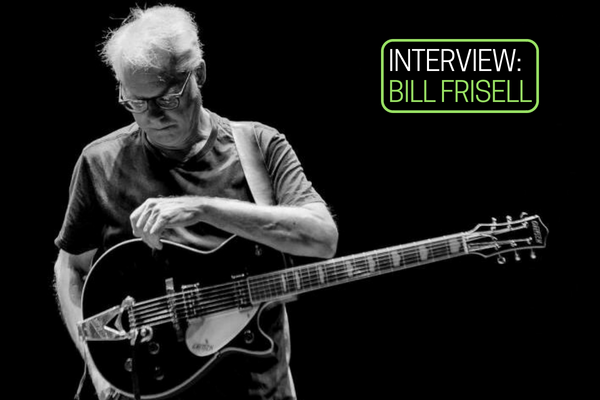 Find out more about Bill Frisell at billfrisell.com.